It took all her strength for she had plenty to say. The careless comment her husband made brought a rush of red into her cheeks and with it, plenty of ammunition. She was exhausted, it had been a demanding day. But, "her way" of handling situations never went well. She was determined to cleave to the Scriptures and give that "soft answer". How the angels must have rejoiced at her triumph! This post may be shared with some or all of the following link-ups: Modest Mom Monday's, Make it Yourself Mondays, Homestead Barn Hop, Natural Living Tuesday's, Teach Me Tuesday, Domestically Divine Tuesday, Raising Homemakers, Wise Woman Link Up, Wildcrafting Wednesday, Frugal Days, Sustainable Ways, Simple Living Wednesdays, Homemaking Thursday's, Farmgirl Friday and Deep Roots at Home. Thank you lovely ladies for hosting these. "When we purchased my great-grandmother's house in 1997, it was in great need of renovating, which we have been working on ever since. This shabby metal cabinet is the only thing that now remains of the original kitchen, and it is still serving a purpose keeping all of my baking supplies organized and pretty." "The jars with the silver lids with the knobs on top are from Target, the rest are all reused from other products, some are newer and some are pretty old." "Inside the cupboard, I keep all of my baking essentials. I like to make my own baking mixes for muffins, cornbread, pancake mix and biscuits and I've found the easiest way to store and use them is quart size wide mouth canning jars with a simple label on the lid." "This is also a good place to make extracts since it's cool and dark inside. The paper bag on the right is my current vanilla extract in progress. The bag assures that it's nice and dark. The jar in the center is my finished vanilla extract that we are currently using. The small jar on the left is my newest project, lemon extract." 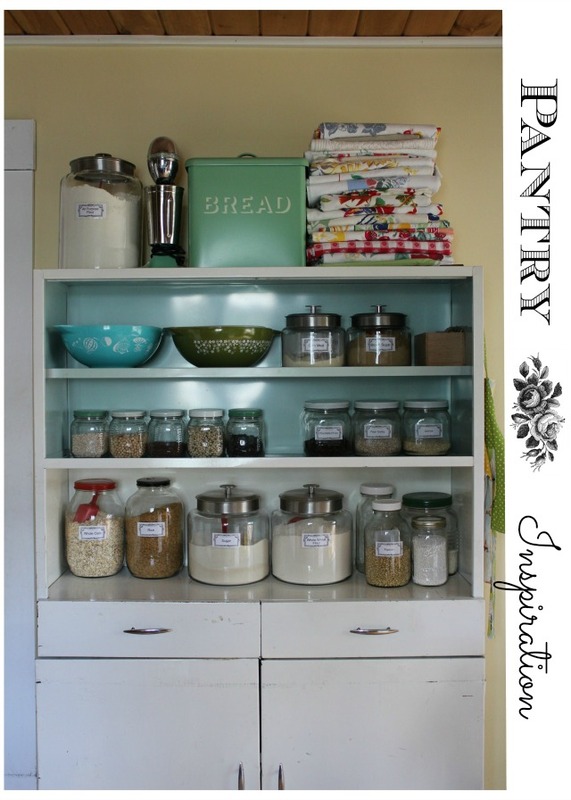 Isn't her baking pantry charming? I hope you enjoyed your "tour" as much as I did! Thank you Melissa! 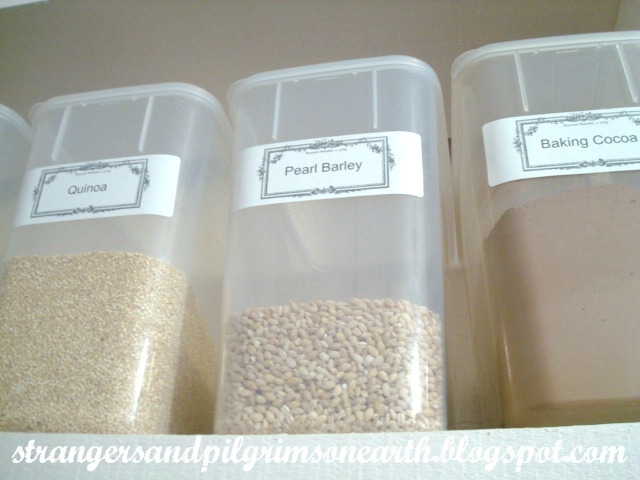 Here is how she applied our labels to her jars: First, she printed them onto printer paper and cut them to size. Next, she cut pieces of clear contact paper (about 1/2 an inch larger all around). 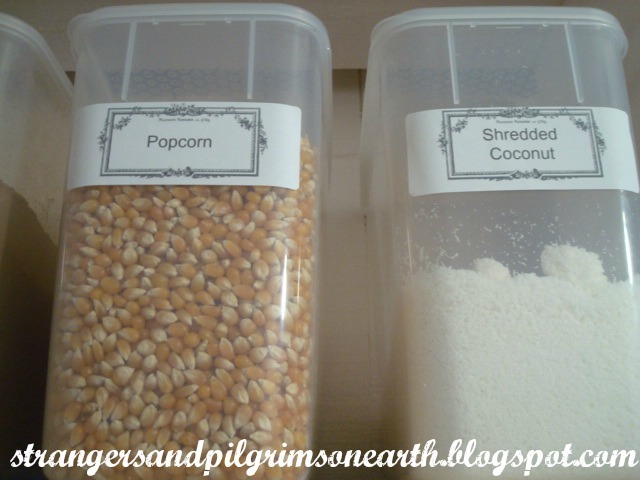 She placed the pantry label onto the sticky side of the contact paper and carefully affixed them to her containers. You will find Melissa's other beautiful projects in pictures here. 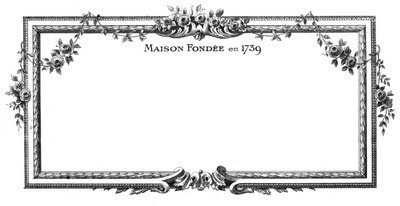 Did you spruce up your space with some of our printable labels? Please email me with your photos as I would love to see your prettified places. Happy homemaking! 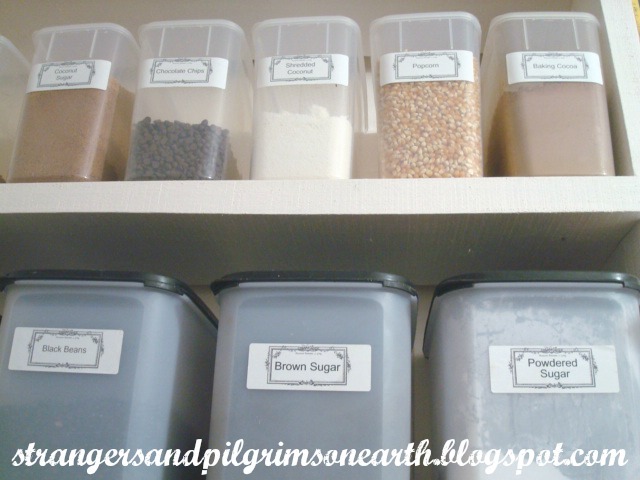 giving the sight and smell of goodies on the shelves…"
Since many think of "food storage" in huge plastic containers with fancy lids and five years worth of provisions, the idea can be very overwhelming. However, when you start small (which is what the home pantry does), you will still reap many rewards. More Affordable ~ It is cheaper to purchase in bulk because you are not paying for the fancy packaging, expensive store space and merchandising. You are paying for the actual food itself ('tis a novel concept). Saves on Gas ~ The least often you go to the grocery store, the less money spent on gas (along with wear and tear on your vehicles). Saves You Time ~ The least often you go to the grocery store, the more time you will have to live your life. 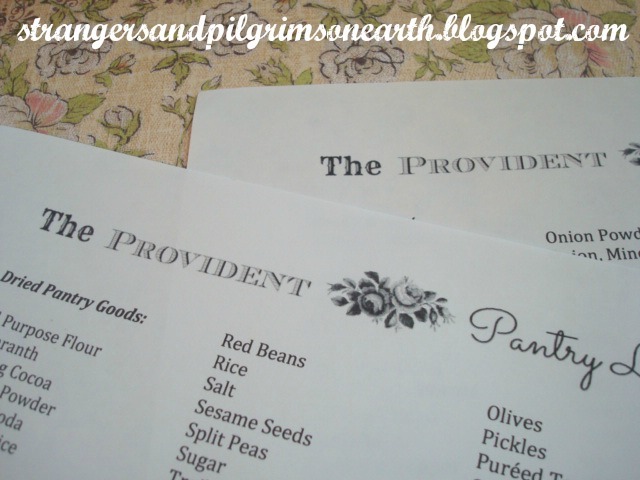 Economical ~ Because you are preparing during the good times (right now though it may seem like hard times), you can accumulate your pantry foods during sales and harvest abundance (by canning, freezing, drying foods in season). This eases the financial burden allowing you to slowly build up a reserve without overwhelming your budget. Convenience ~ When you want to prepare something, a proper pantry will provide what you need to accomplish your culinary goals. To be Prepared is Better than Panic ~ If a natural disaster strikes, computer malfunctions, severe power outage, act of war occurs, most stores have a limited stock and will be sold out in a few hours. You will be that much more prepared if you have a well stocked pantry. 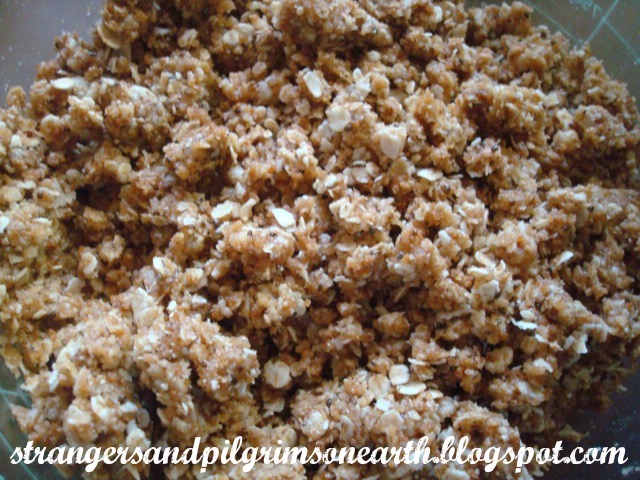 Healthier ~ You will be encouraged to cook healthy grains and legumes from scratch because that is what is surrounding you. Without a pantry, you may have the desire to purchase convenience foods or take out (which is packed with preservatives and very expensive). Steadfast Storage ~ In the event of an economic crisis, financial hardship, food shortage, etc., you will be that much more prepared to get through the rough stages. 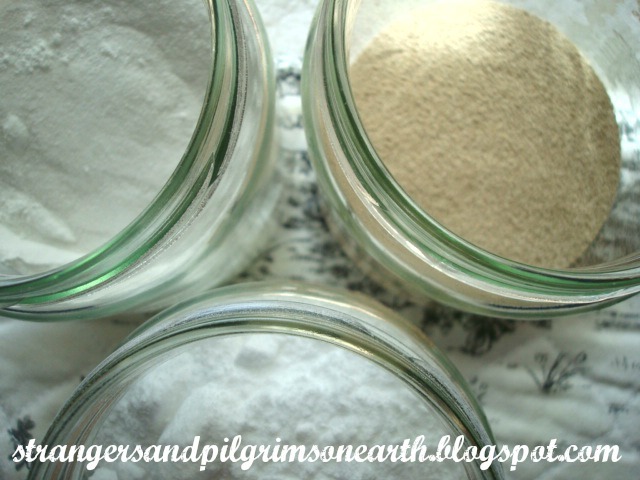 It's Pretty ~ Imagine beautiful jars and canisters full of nourishing food, gleaming in rows. 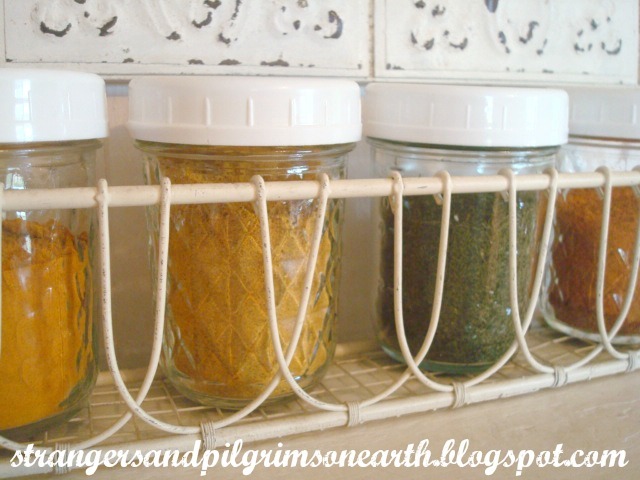 What more practical but pretty decoration can you think of for your kitchen space? It's Fun ~ It is like owning my own general store. 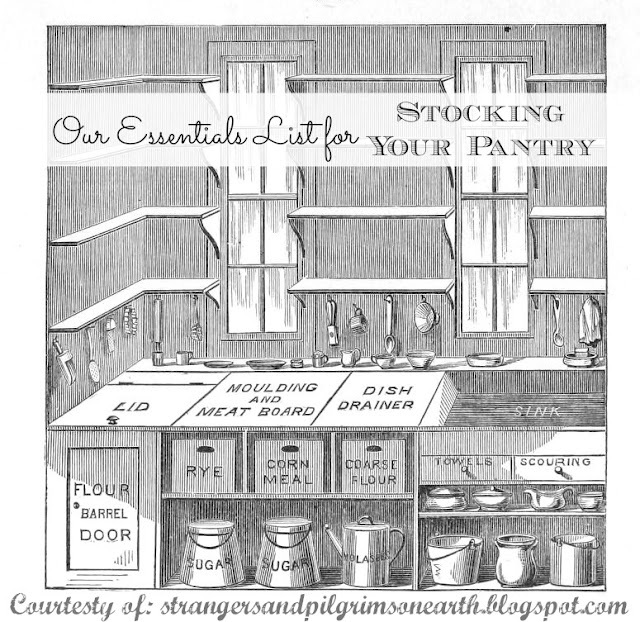 I think of our pantry as a homemaking hobby. I love to scout the thrift stores/garage sales for creative containers and challenge myself to find the most nourishing food at the best prices. Do you have any other reasons to add? Most people feel secure in having car insurance, life insurance, homeowner's insurance and a savings account. Think of a well stocked pantry as your source of food insurance. It will never be a waste or loss if properly tended to. It is tangible and everything your prepare can and will be used on a daily basis. Food may never be as affordable as it is today, so I encourage you to create a well stocked pantry. 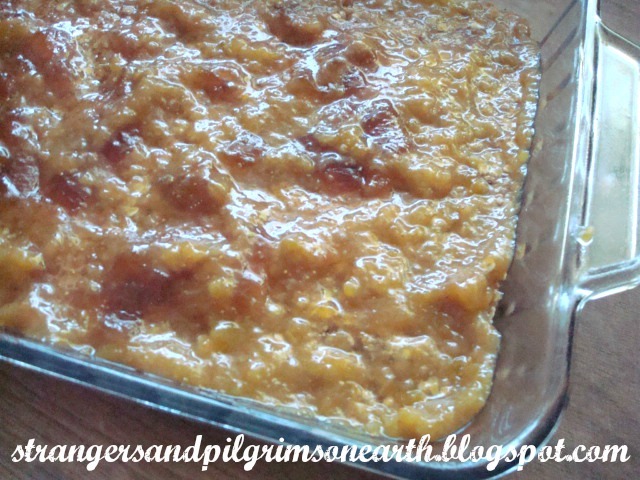 The inspiration for this recipe came from Country Momma Cooks. 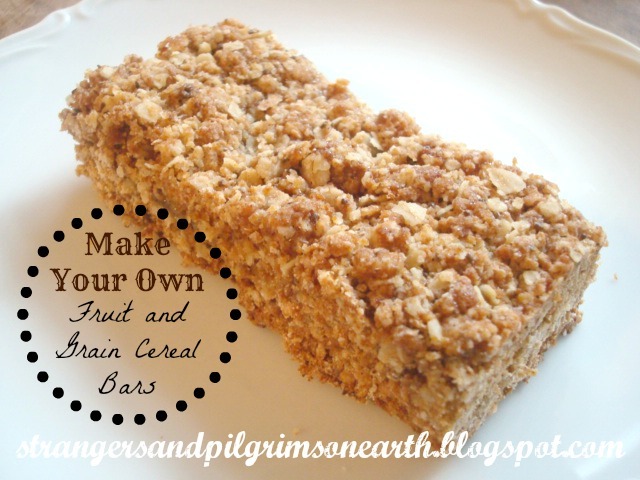 I changed four of the ingredients but the principal is the same, a healthier snack choice than those bars filled with high fructose corn syrup and such. These would also make an excellent breakfast "on the go". To begin, pre-heat your oven to 350 degrees. Grease a 9x13" pan. 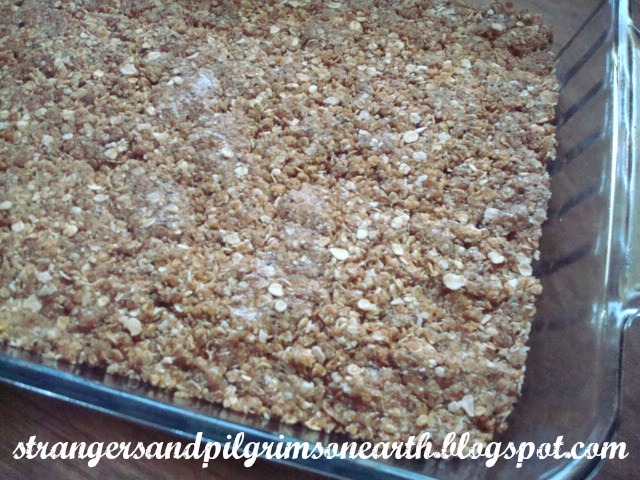 In a large mixing bowl, combine flours, oats, chia, coconut sugar, cinnamon, sea salt and baking soda. Add coconut oil, a beaten egg and vanilla. Stir by hand until combined. (you can see I didn't blend in the coconut oil as well as I should have but it had no effect). Then, evenly spread the jam over the crust. Why is my jam two-toned and weird looking? I started off using my sugar-free fig jam and ran out. Then I added some regular fig jam which is darker. I also noticed the chunks were too big. So, midway I blended the second half before I added that. How often does things like this happen to you? 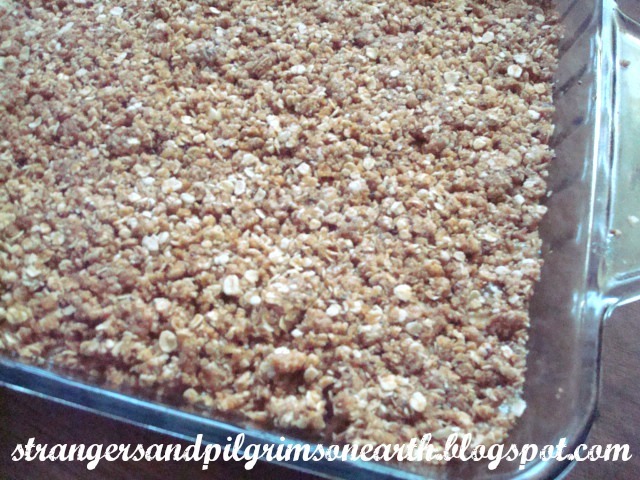 The next step is to crumble the remaining mixture evenly over the top. Gently press down and bake for 20 - 25 minutes or until golden brown. Once cool, cut into 14 bars and wrap individually for convenience. I recommend refrigerating these to keep them nice and solid. They are delicious with a cup of milk and are very satisfying. 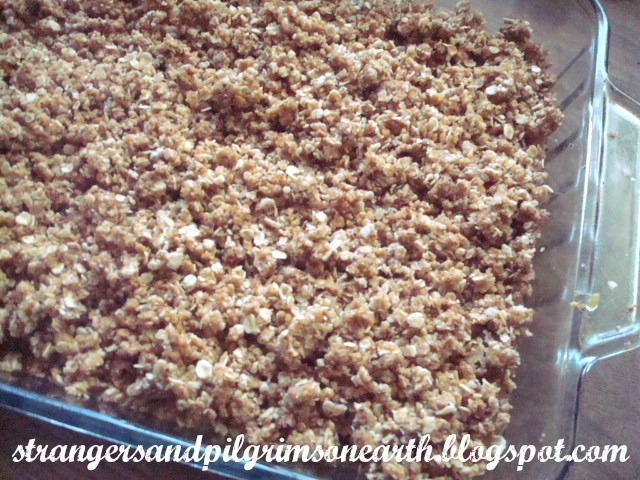 You may also be interested in making our "Chewy Chocolate Chip Granola Bars". "Hearty foods are those in which there is an abundance of potential energy." to be useful or believe to be beautiful." Spread the cheer throughout your cooking areas. I like to group my "like kind" containers together for a streamlined look. 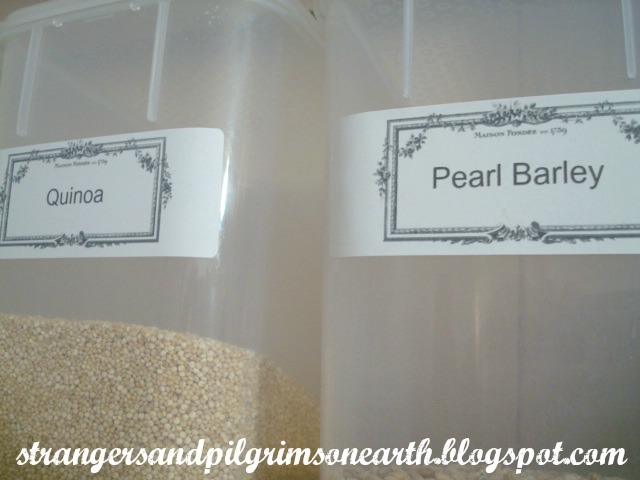 We applied some labels to our plastic containers, fido jars, canning jars and on my favorite canister jars. They can be placed inside the pantry to dazzle the homemaker's eyes while some may be displayed on open shelves to greet and welcome her guests. "Undoubtedly much of the distaste for, and neglect of, "housework," so often deplored in these days, arises from unpleasant surroundings. 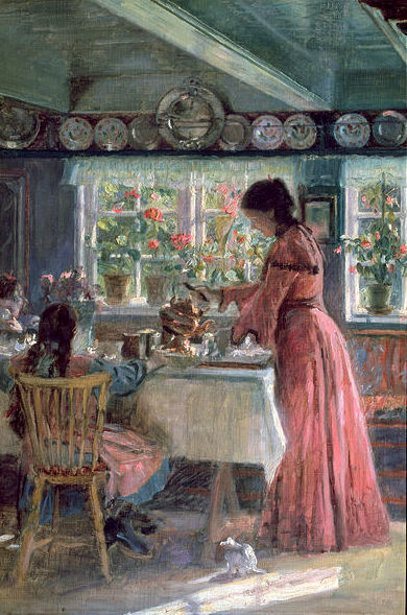 If the kitchen be light, airy, and tidy, and the utensils bright and clean, the work of compounding those articles of food which grace the table and satisfy the appetite will be a pleasant task, and one entirely worthy of the most intelligent and cultivated woman." We would like to share our pantry labels with you, dear reader. This is an expanded version of our last set which now includes five pages! We have also included some blank labels on this printable so that you can customize them to fit your needs. The original label (shown below for further customization) is compliments of The Graphics Fairy. You may also be interested in our "Gluten-Free Pantry" labels addendum, "Nuts and Seeds" labels and our matching "Seasonings, Spices and Such" set. I invite you to subscribe to this blog (located on the sidebar) to get updates and access to future homemaking printables. Simply download and print the PDF file for FREE from HERE. You can either print them out on plain paper, cut to size and affix to your containers with glue (or decoupage) or print them out on sticker paper and cut to size. If you choose the first route, you may want to place a piece of packing tape or clear contact paper over each label to protect them. I used the template for our old Avery labels and printed directly on them. "I will abundantly bless her provision: I will satisfy her poor with bread." Here are some important things you will want to remember when purchasing in bulk. Storing a large quantity of food is not prudent if your family won't consume items prior to their expiration. 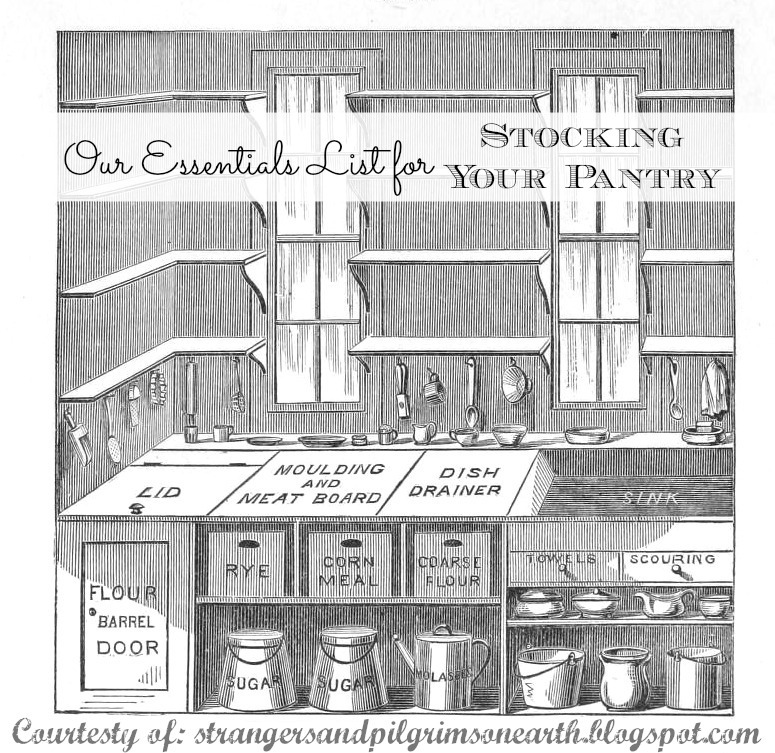 We are also sharing some of our personal preferences for stocking a pantry. First and foremost, keep in mind that all your food will last longer when stored in a cool, dry, dark area, away from direct sunlight (such as behind a cabinet, curtain or closed door) and in airtight containers. Resist the urge to show off your canned goods because sunlight will compromise the quality of your food (and may spoil in time). Heat should be avoided also (so do not store next to stoves, furnaces, etc.). Nuts can go rancid rather quickly (and are very expensive! ), so once the package is opened (especially in the warmer months), we store our excess in the freezer and keep only a small amount in our pantry. Pine nuts and pistachios are the most sensitive to expiration dates. Whole seeds may last between 1 - 4 years (depending on the kind), if stored properly in airtight containers, and out of direct sunlight. 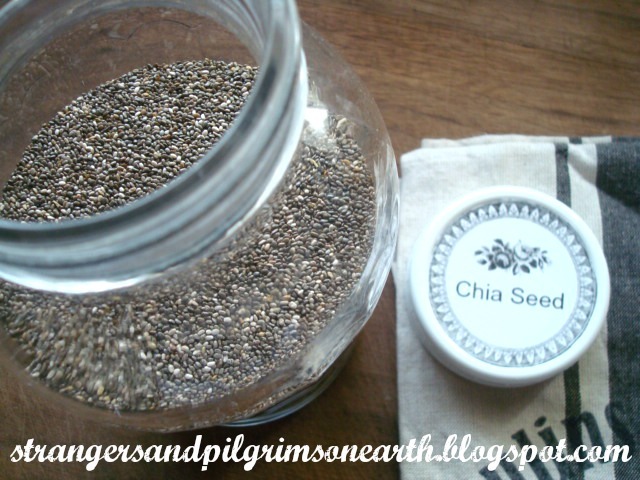 Chia can last from 2-4 years, flax for 1 year, while pumpkin seeds and sesame seeds have a shorter shelf life of 2 - 3 months in your pantry (though longer in the refrigerator). 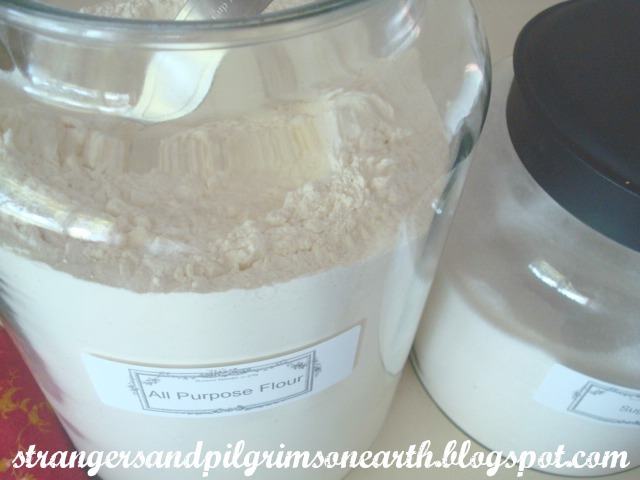 Whole grain flours such as whole wheat flour have a shorter shelf life (about 3 - 6 months) so I keep a smaller supply in the pantry and store the rest in the freezer. 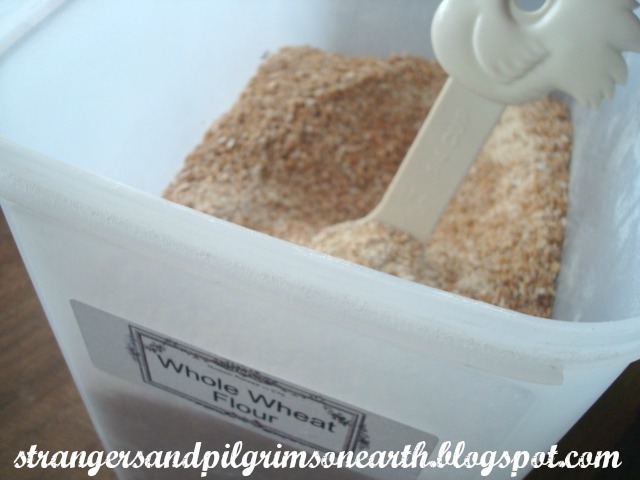 Because of the wheat germ content, it tends to go rancid quicker than the processed white flours. Intact (un-ground) whole grains will last longer in your pantry. Spices stored properly in airtight containers should last a year and will begin to lose potency after that. Yeast, baking soda and baking powder should be watched carefully for expiration dates because they will lose their strength and will compromise your baking. Generally, baking soda should last two years while baking powder will last 18 months. You can also freeze your yeast to extend its shelf life. Most other food items such as dried pastas, rice, sugars, beans, canned and bottled foods will generally last one to two years (use your discretion). We like to keep a larger amount of honey in our pantry because it boasts an excellent shelf life (practically indefinite) and is therefore an excellent preparedness food. 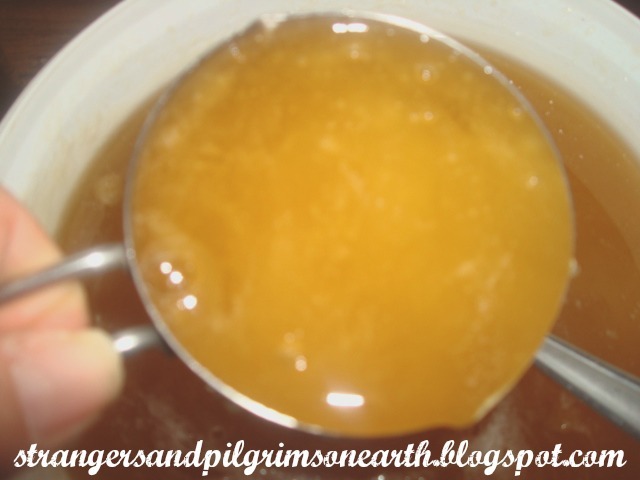 It is more affordable to buy raw honey in bulk via 5 gallon bucket if you can find a local source. We maintain a larger inventory of tomato puree because it is so versatile. You can prepare Italian dishes, Mexican dishes, soups, sauces and stews with it. We store a larger quantity of vinegar because the shelf life is almost indefinite. We use the white vinegar for cleaning and canning so it helps to be stocked. Balsamic and red wine vinegar are delicious as dressings and raw apple cider vinegar is simply excellent for your health. We also keep a large quantity of certain oils. The shelf life of unrefined coconut oil is about 2 years (some claim even longer) if properly stored away from direct sunlight. Also, high oleic sunflower oil boasts a longer shelf life so we purchase a case of this. Unopened grape-seed oil should keep 1-2 years (unopened) in a cool, dark place. Unfortunately, olive oil goes rancid rather quickly (so I would maintain a smaller inventory of it). Water is one of the wisest items to store. Being on a farm with a climate prone to powerful storms, we lose electricity often (which is what operates our well pump which means no electricity, no water if our tank isn't full). I encourage everyone to store what you can because every area is prone to some sort of disaster (please know that this is not meant to scare but simply encourage you to prepare). 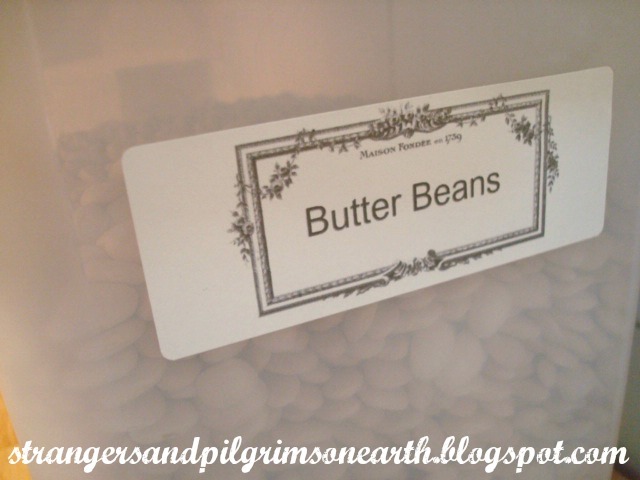 There are many options for storing foods in a larger scale for a longer period of time. However, these posts are intended to aid the home pantry while trying to maintain a fair amount of food storage for practical and preparedness purposes. We hope to go into detail of longer term food storage in the future. Do you have any tips you would like to add? 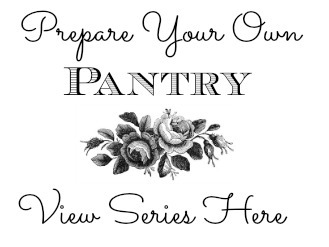 We will be sharing the first set of pantry printables in our next pantry post. This post may be shared with some or all of the following link-ups: The Art of Home-Making Mondays, Modest Mom Monday's, Homestead Barn Hop, Monday's Musings, Marriage Monday, Titus 2sdays, Titus 2 Tuesdays, Raising Homemakers, Make Bake Create, Wise Woman Link Up, Christian Homemaking, Wow Us Wednesdays, Wildcrafting Wednesday, The Scoop, So Much at Home, Homemaking Thursdays, Home Sweet Home, Hearts for Home Thursdays, Growing in Grace Thursdays, Home Acre Hop, From the Farm Blog Hop, Farmgirl Friday, Front Porch Friday Blog Hop, Simple Meals Friday, Cultivate Nourishing and Clever Chicks Blog Hop. Thank you lovely ladies for hosting these. 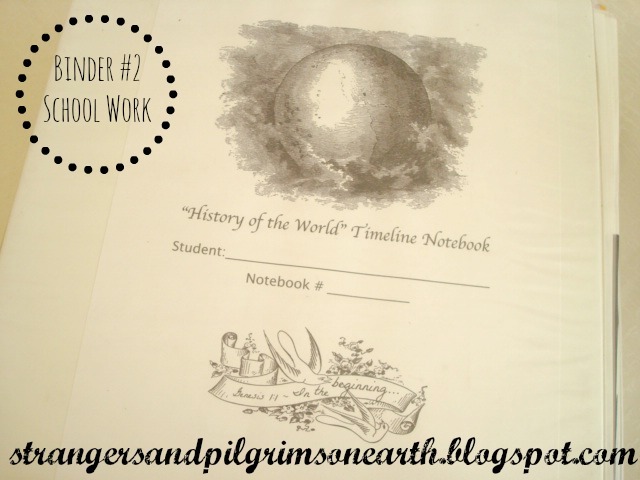 Welcome to "Part 5" of our "History of the World" Timeline Notebook Study (Part 1 is shared here, Part 2 is here, Part 3 is here and finally Part 4 ~ Practical Ideas). This is the final segment where we share how to prepare for your world history study. One of the first things you will want to do for this study is make sure all your participating students have two 3" binders. One to specifically keep your Book of the Centuries timeline and one to keep their actual school work. This can be tailor made to your homeschool. I am simply sharing how to prepare for a study similar to ours. Prepare and print off binder inserts for each of the two binders per student (printable consists of both cover pages and spine inserts). 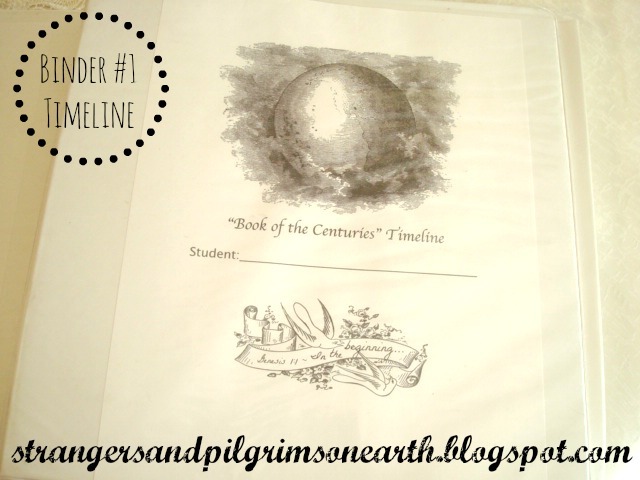 Print off a Book of the Centuries timeline for each student (place in binder #1 which is labeled "Timeline"). As you learn about people, places, events, paste in relevant clip art in each time period. You may also want to paste down a brief explanation under the clip art. 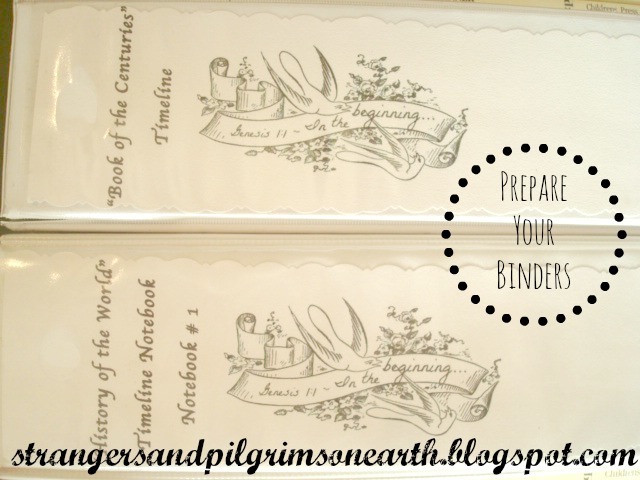 Accompanying school work with each time period will be placed chronologically in binder #2. For example, when you study Creation, label a tab and place all your creation related copywork, artwork, picture studies, book lists, etc. in that section. When you go on to the next major subject in history, make another tab and place corresponding work behind it. As a binder fills, begin another. You are making your own family encyclopedia set! Where to Start? Start studying the beginning of history (creation) and move forward until you meet the present day… We will be sharing our journey with you in future posts to give you an idea of what it will look like. Important Note: You will need to decide what chronology you are going to follow. Here is where it can get a bit messy. The Lessons from History Series follows the traditional timeline but with biblical information. However, some believing archeologists have proposed a "Revised Egyptian Chronology" where the reign of Egpyt has been shrunk dramatically. Either way, decide which route you want to go and follow it throughout your whole study for the purpose of continuity. We ended up going with the revised timeline because the arguments made in this book were highly plausible. Unfortunately, it made it a bit harder to discern some dates and became somewhat confusing in the beginning. If I were to do it again, I may have just kept the traditional dates knowing that they were subject to interpretation because it would be easier for labeling purposes. 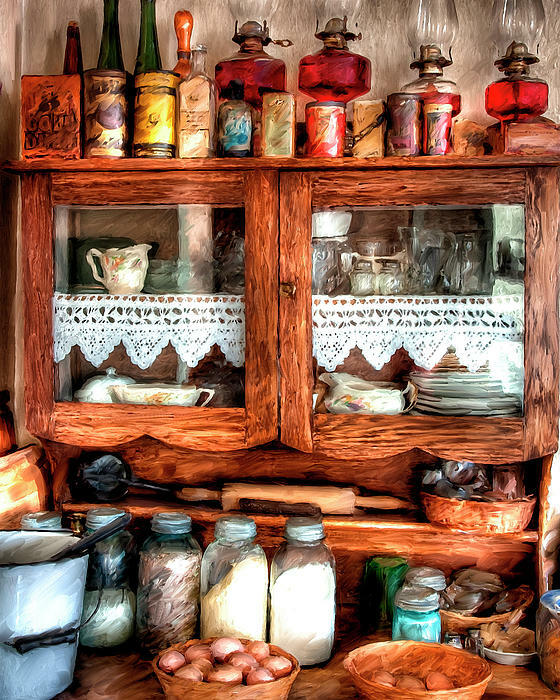 "Every house needs a storeroom, in which to keep tea, coffee, sugar, rice, candles, &c. It should be furnished with jars, having labels, a large spoon, a fork, sugar and flour-scoops, a towel, and a dish-cloth." Cross off the items that don't appeal to your family and you have a personalized source of what to stock in your pantry. 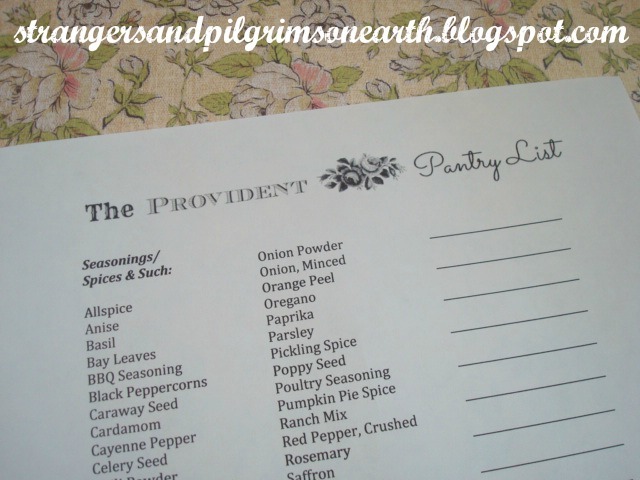 This can also be used as a master grocery list when you add your fresh food needs (blank lined spaces are provided on printable). 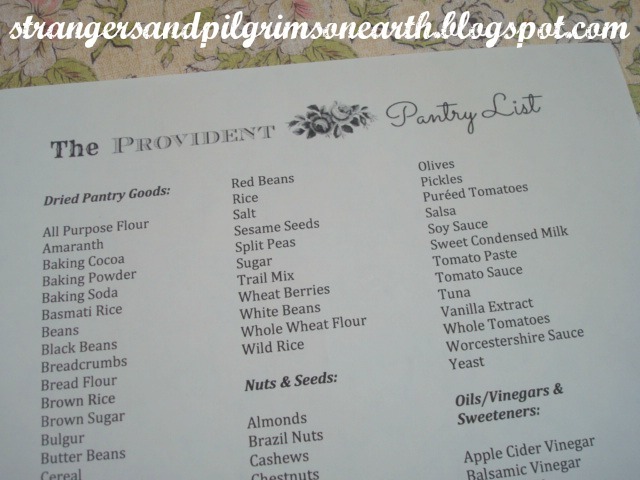 I hope this basic printable will be a guideline for inspiring you to prepare your own healthy and provident pantry! 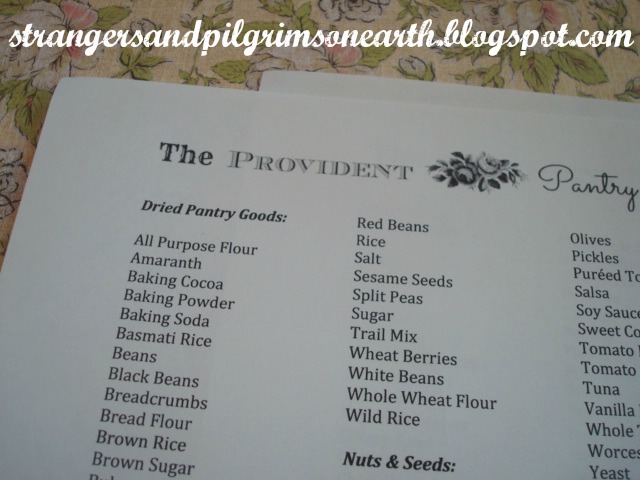 Simply download the "Provident Pantry" list from HERE. 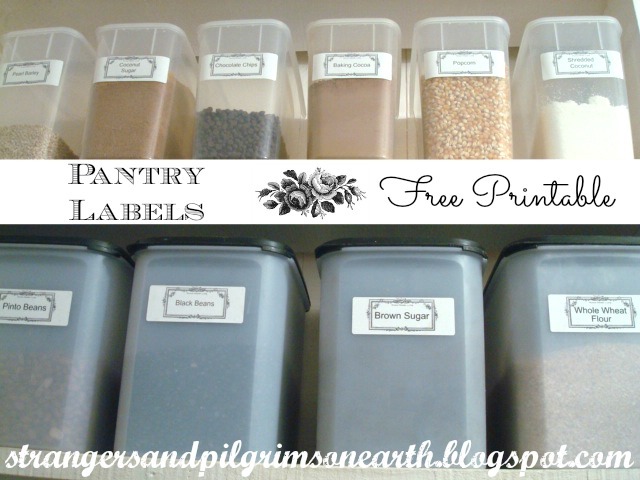 You may also be interested in our matching pantry labels or our other household printables. 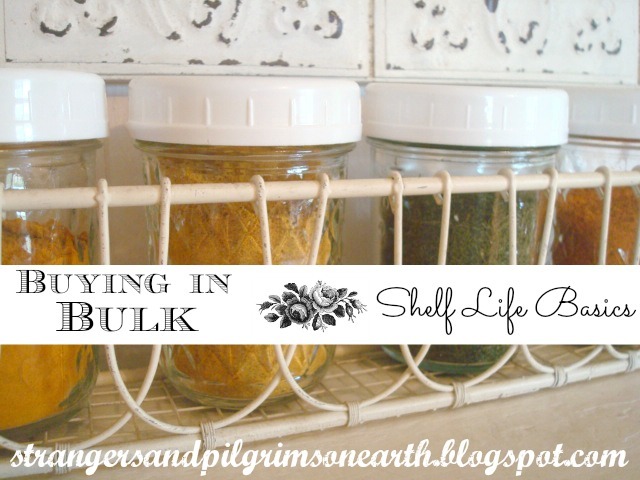 Note: Before you begin buying excessively in bulk, you may want to read our "Pantry Shelf Life" post. Though you may be purchasing with good prices, it is never a good value if your food goes rancid. She slowly crawls out of the warm bed and into a soft robe. She tiptoes through the dark house and heads to the kitchen to turn on the stove. The perking coffee and rich aroma lulls her into a reverie. This is her morning. She calmly whispers a prayer for the day. She has taken control. She does not have to rush. She quietly sets about her routine. A bit of reading, some biblical encouragement and now the steaming mug is in her hand. It keeps her cozy with its thick cream and honey. She breathes deeply and basks in this early hour. Soon the home will become alive. She is ready for it. She will carefully fix the bed, prepare the meal, fluff the cushions and start the wash. When her morning is not stressed, the home is peacefully and beautifully blessed. 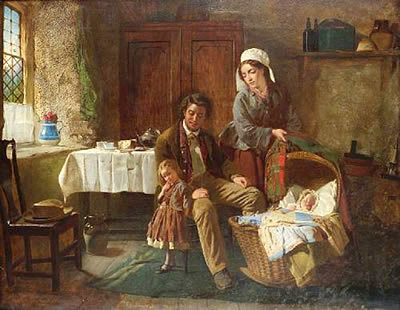 "She riseth also while it is yet night…"
"EARLY RISING IS ONE OF THE MOST ESSENTIAL QUALITIES which enter into good Household Management, as it is not only the parent of health, but of innumerable other advantages. 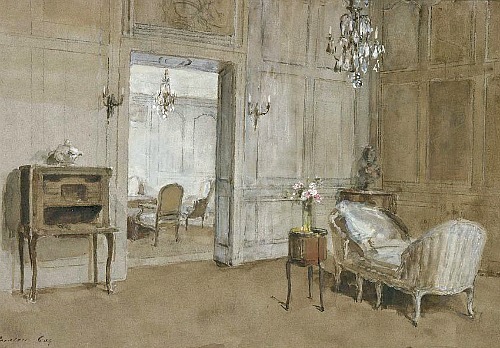 Indeed, when a mistress is an early riser, it is almost certain that her house will be orderly and well-managed..."
One whole wall was shelved from the ceiling halfway down. The upper shelves were empty, but on the lowest was a glass lamp… At the end, where this shelf was above the window shelf in the corner, stood a row of cans of spices. Beneath this shelf were many drawers of different sizes. Directly below the spices, and above the window shelf, were two rather narrow drawers. Laura found that one was almost full of white sugar, the other of brown sugar. How handy! 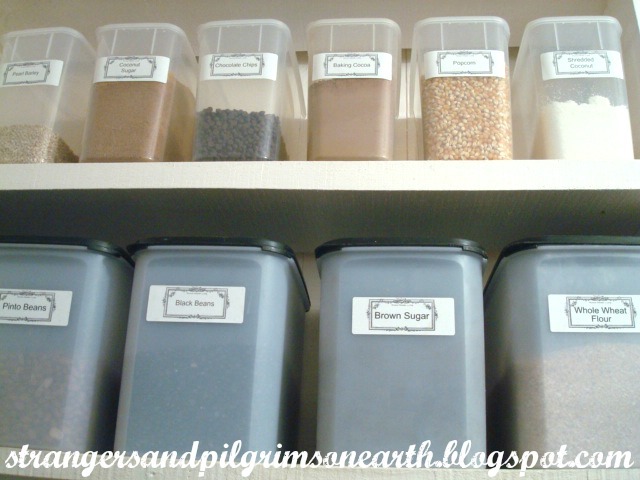 Next, a deep drawer was full of flour, and smaller ones held graham flour and corn meal…"
How I appreciate a well organized pantry, one that is loved with it's orderly arrangement while providing the family with nourishing meals! It speaks to me of preparedness, blessings, sustenance and provision. When properly maintained, it is like a private grocery store located in your own home *dreamy sigh*. The second step is to stock up on items that you use often when they are on special. Just make sure your family will be able to finish the products prior to their expiration dates. For example, a surplus of whole canned tomatoes, honey, certain oils and vinegars will always be a good thing because of their variety of uses and excellent shelf life. The third step which requires some time and effort is to plant a garden and preserve the abundance by freezing, fermenting, drying and canning your own food. If you can make goals for yourself during the harvest to put up at least one batch of food per week, you will be building up an inventory and your grocery store bill will start to decrease. Do you have any fruit trees on your property (or a does a family member and/or friend)? We have our fig trees that we make into jam, our pomegranate trees that we juice and freeze in ice-cube trays for smoothies, etc… Our neighbor gives us loads of lemons when they are season. Here is what we did with them to increase our pantry inventory. I think you get the idea. 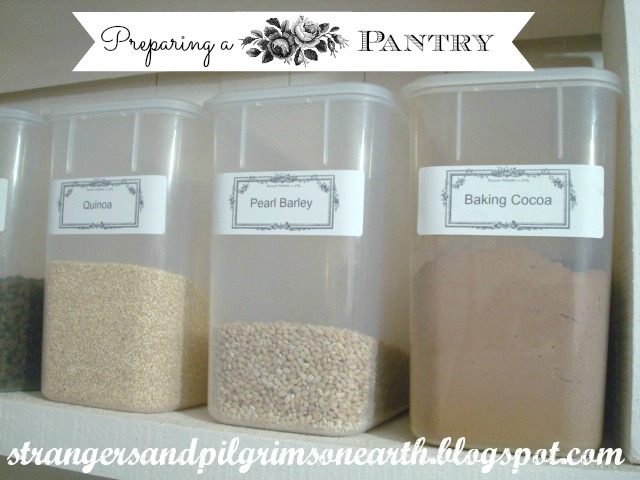 Create items for your pantry using your own resources. Don't buy these products when you can produce them frugally. The final step is to forage your fields and see what wild plants you can preserve and utilize (this is something to do when your garden is not producing). For example, we have loads of chamomile flowers (soothes stomach and nerves) and stinging nettles (excellent for allergies) which can be dried, stored in jars and used for tonics, teas and tinctures. We also have lavender plants which we use in many ways. Be resourceful with what you have to increase your provisions without spending a dollar! This post may be shared with some or all of the following link-ups: Modest Mom Monday's, Make it Yourself Mondays, Homestead Barn Hop, Natural Living Tuesday's, Teach Me Tuesday, Domestically Divine Tuesday, Raising Homemakers, Wise Woman Link Up, Wildcrafting Wednesday, Frugal Days, Sustainable Ways, Simple Living Wednesdays, Farmgirl Friday and Deep Roots at Home. Thank you lovely ladies for hosting these.